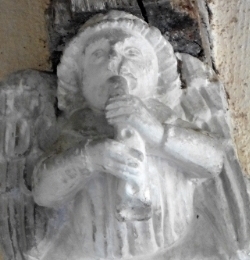 It is one of the many joys of visiting older churches to discover the myriad details tucked away in odd places, such as the small-scale figures and creatures which enhance the ends of stone hood mouldings beside a doorway, or adorn the corbel supporting a beam, or are hidden within wooden roofs or carved on furniture. The iconoclasts of the 16th and 17th centuries have ensured that hardly any large scale medieval figure sculpture survives in Britain’s churches and while Victorian sculpture can show marvellous craftsmanship and great beauty, restored architectural details can lack conviction to an eye trained on medieval work. Of course, that is partly because later work lacks that ‘patina of age’ which older survivals retain, an antiquity that can lend greater interest even when the original sculptural quality is not high. Centuries of built up limewash can make identification of some stone sculptures quite difficult and modern interventions do not always respect the character and setting of such antiquities either. 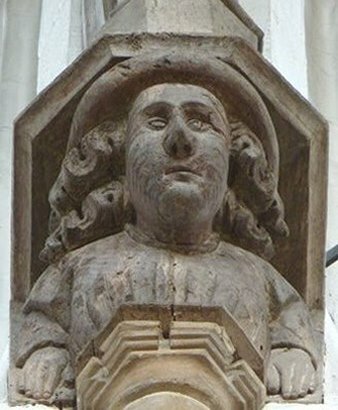 Church visitors today are often keen to track down a ‘green man’, a human head shrouded in foliage or with its features created from leaves and branches. The term was probably coined by Lady Raglan in 1939 in an article which she contributed to the journal of the Folklore Society. Previously, the medieval scholar CJP Cave had written in 1932 about the hidden faces in the foliage bosses of Ely Cathedral Lady Chapel. The faces reminded him of the Jack-in-the-Green figure that could then still be seen in rural May Day celebrations. Both authors explored the possibility that such sculptures were evidence of continuing pre-Christian myths (if not practices) in the Middle Ages, so that now the green man is often explained away as a pagan hangover. Heads created from leaves, usually called ‘foliate heads’, are seen continuously on buildings and monuments across Europe from at least the second century. Some fine examples are illustrated in the sketchbook of Villard de Honnecourt (c1230), unfortunately without any accompanying explanation. Like the rest of his drawings, they are intended to be aides-mémoires. Other green man variations include heads buried in vine scrolls or with leaves sprouting from their mouths. These too have a very long provenance in architectural stone decoration, especially on capitals. Rather than demonstrating the survival of paganism, the many English medieval examples can be seen as belonging to a long-standing tradition of depicting danger and evil. Woods were dangerous places in medieval England, easily associated with the devil’s work, and masons of each generation re-interpreted the tradition in their own style. But to what extent was the mason responsible for the subject he was carving? 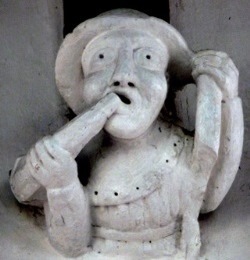 Influenced by Victorian ideals, modern churchgoers and visitors might feel that using pagan, satirical, if not downright rude sculpture on a church is sacrilegious. While cathedral guides might revel in stories about masons hiding their little jokes from the foreman, in the end someone paid for the work and had an ulterior motive for doing so. It may have been rare for patrons like a bishop, abbot or earl to become personally involved at such a detailed level, but their project manager (with whatever title he held) certainly would, if only to ensure he wasn’t blamed if his master disapproved of the work or its cost. All we can be sure of is that the medieval mason was working within well-known traditions and to an overall scheme. As today, it can be difficult to attribute the precise source of an idea to one member of the design team. We can quickly identify biblical scenes such as the Nativity and the emblems of major saints, such as St Catherine’s wheel. Symbols of the Trinity or Passion are less well known perhaps, but is there a message in the small-scale figures, faces and creatures too? While literacy increased in the Middle Ages, the great majority of people entering a church would not have been able to read (and in any case, any script was most likely to be in Latin before the 16th century). Medieval people certainly recognised many more scenes from the Bible than modern churchgoers, but there were plenty of other sources of inspiration for painted and carved decoration. Hagiographical stories were also widely used to convey Christian messages. Morality tales like the Three Dead Kings were also widely known, not least through the plays regularly performed by travelling actors and troubadours. Although we may have over-romanticised the imagery of church wall-paintings and windows as the poor man’s Bible, there is no doubt that a church building of whatever scale or pretension was full of meaning to everyone who entered it. Unfortunately, very few wrote down their thoughts. However, we do know a little more from the work of William Durandus who died in Rome in 1296. A canon lawyer with a long Papal career, Durandus became Bishop of Mendes, in the south of France. His book Rationale Divinorum Officiorum describes the origins and symbolism of churches and their ornaments in some detail. He explains that ‘the material church, wherein the people assemble to set forth God’s holy praise, symboliseth that Holy Church which is built in Heaven of living stones’. Other writers also allude to church buildings as the House of God representing heaven on earth. Given the vast differences between churches and people’s homes, it is not difficult to see how this concept worked. Durandus assigns attributes to different parts of the building, often linking them to quotations from the Bible. So the foundation is Faith, ‘which is conversant with unseen things’, the roof Charity, ‘which covereth a multitude of sins’ (1 Peter 4: 8), the door Obedience and the pavement Humility, ‘my soul cleaveth to the dust’ (Psalm 119: 25). The glass windows ‘are the Holy Scriptures which expel the wind and rain, that is all things hurtful, but transmit the light of the True Sun, that is God, into the hearts of the Faithful. These are wider within than without because the mystical sense is the more ample and precedeth the literal meaning.’ The latter is an interesting comment on the practical use of splays to admit more light through thick walls but it also illustrates just how differently medieval churchgoers saw and understood religious architecture in comparison to modern observers. However, that concept of each church being an earthly image of heaven readily explains why roofs came to be extensively decorated with angels, with their principal timbers rising from corbels fronted by angels holding the symbols of the Passion, musical instruments or the coat of arms of the patron. Such angel corbels become ubiquitous from the late 14th century across the country. In East Anglia, angels also peppered the roof; the hammerbeam roof of St Wendreda’s March has no less than 118 winged wooden angels ranged in rows along the wall-plate, completing the hammerbeams and perched centrally on the collars. The most visible are those beneath the standing saints against the wall posts, each playing a different musical instrument. Whether their function is to support the roof post or the saint seems to have been deliberately obscured to emphasise the floating nature of the roof as an image of heaven. Even in much less grand churches, the principal roof timbers are frequently seen to be ‘supported’ by angels. In All Saints, Landbeach, north of Cambridge, there are 15th-century wooden, now wingless busts in the north aisle, some with scrolls, some in prayer. Because most of them emerge from clouds formalised into triangles, they are likely to be angels. 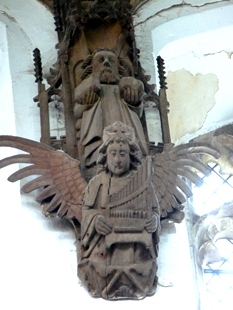 There is no doubt about the angels on the stone corbels beneath the south aisle timbers, because these have wings and play musical instruments (Figure 3). The wooden busts were clearly added to the wall posts and although the posts stand on the stone corbels, neither type of corbel is structurally essential to the stability of the wall post or principal roof timber rising from it. Indeed, there are many examples of wall posts or principal timbers left ‘hanging’ over windows. Stone corbels might provide an element of restraint if the roof ‘racked’ (a horizontal movement of the apex at right angles to the line of the trusses) and they were probably useful during construction. Clearly, however, corbels were also a neat way of visually linking a roof structure to the wall, helping it to seem part of the fabric of the building rather than just sitting on top of it. The tradition of using carved stone corbels perhaps derives from stone vaults, although their ribs normally rise from capitals on wall shafts and these are usually foliate or moulded. However, Romanesque churches had external corbels below the eaves which have their architectural origins in classical brackets (and before that, the ends of roof timbers). Although most frequently carved as human heads, they could be animals, figures or grotesques. Explaining the relative lack of external decoration of churches in comparison with their interiors, Durandus writes: ‘for although its outward appearance be despicable, the soul which is the seat of God is illuminated from within’. It has therefore been taken that the grotesques and gargoyles seen on church exteriors are there to defend the building (heaven) and those within it from ever-present evil by fighting the Devil with his own. Nevertheless, demonic characters are also found inside. Bishop Northwold’s choir at Ely Cathedral (1234-52) has grimacing heads at the bottom of the extravagant foliated vault corbels at all four corners, carved by the same sculptor as the external corbels. As Revd Lynne Broughton argues in Interpreting Ely Cathedral (2008), they have been interpreted as reminders that although ‘the cathedral signifies the Heavenly Jerusalem, it is not yet Heaven itself’, so even in the most sacred of places ‘the darkness of evil has not yet been overcome’. The famous Lincoln Imp overlooking St Hugh’s shrine is a similar, if more mischievous, reminder. This same interpretation must apply to those miniature beasties found tucked away in the spandrels of rood screens and on the cusped arches of monuments and sedilia (the canopied niches to the right of the altar). These fanciful creatures may well have been used by priests during sermons or for teaching. More intriguing are the more obviously human figures seen on roof corbels from the late 14th century, at about the same time that angel corbels started to be so widely used. It might be expected that the Prior at Ely would not presume to decorate the corbels of his Great Hall with angels. 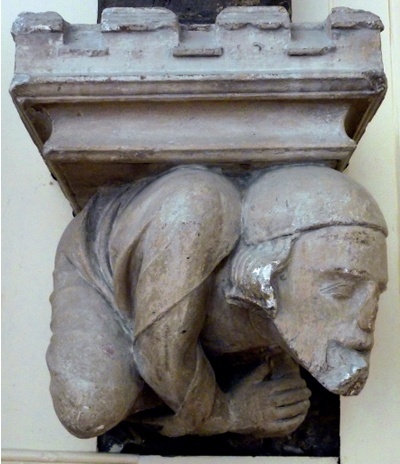 Those now visible in what has become the Bishop’s House are first class sculptures of secular characters (see first illustration) and stylistically close to work seen in the cathedral octagon (completed 1340). Traces of colour grin through recent paint layers, reminding us that all these stone and wooden carvings were once highly coloured. The church of Sutton-in-the-Isle just west of Ely and probably rebuilt by Bishops Barnet and Arundel (1366-88) has similar carved figure corbels (though harshly restored), giving the same impression of carrying the wall post on their backs. They derive from classical ‘Atlas’ figures and were used in the Romanesque period, for example supporting the ribs of the chapter house at Durham. Elsewhere in Cambridgeshire around 1400 such Atlas figures can be quite comical. 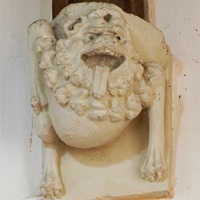 At Barrington and Whaddon, the same mason seems to be following the Ely and Sutton style, but his faces can be quite grotesque and snarling lions (Figure 6) and winged demons now appear in the set. They also seem to be shouting at the congregation below (Figure 8). Are they warning or denouncing? At Harlton and Harston a little later, the mood lightens with distinctly secular figures, some of them musicians, others gurning (Figure 2). The faces seem standardised, but here and there is the suggestion of a portrait, perhaps caricaturing the mason’s workmate! 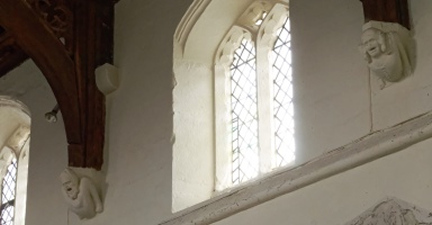 Portraits can be more confidently identified as such when a man and woman face each other or face down into the congregation from the corbels adjacent to the tower (as at Sutton) or rood loft, suggesting they are the patrons. A very fine set of medieval busts can be seen at St Peter Mancroft in Norwich (Figure 5). Although sited on top of a castellated stone capital, they are actually of wood like the wall post above. 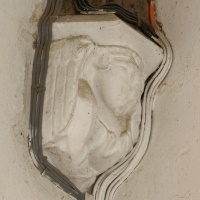 As elsewhere, such fine carvings have had lights and speakers placed up against them and the inevitable cabling can run around them like a noose (Figure 7). Thick layers of limewash obscure details although they can protect the corbel, especially when roof staining or chemical treatments are allowed to run down. Not all stone corbels are carved to the highest standards and we have yet to fully understand what messages their sculpture was intended to convey. Full of character and interest, however, they are valuable survivals of medieval art and deserve both better care and wider appreciation.